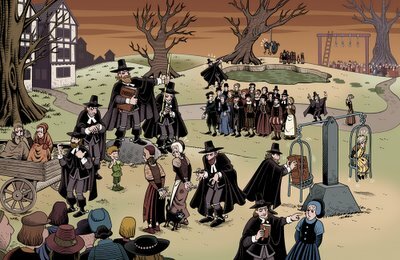 Here's a Horrible Histories illustration of a witch trial. I love witch trials. They never go out of style. Worked on Art d'Ecco today. Aimed for two pages, did a page and a half. Tomorrow I shall endeavour to break the two-page barrier (or the Craig Thompson Barrier, as it's known -- the four-page barrier, or Kirby Barrier, while theoretically possible according to latest scientific research, is far, far out of reach without several more years' worth of intensive training. It involves actually bending the laws of physics to stretch time to twice its normal length, as I understand it). Anyway - onward and upward, and all that.